It’s that time of the year. Live from Cupertino! It’s like old times – JerryWho and Smoothriver are still up too, but hundreds of miles away, and we’re holding our breaths. THERE were several angry moments on the closing day. Gombak Setia Assemblyman Datuk Dr Hassan Mohamed Ali got heated up while he spoke of carpet being ripped off from the floor and sparse furniture when he took office after the swearing-in ceremony. An angry Dr Hassan asked: “Apa ini? (What’s this? )” Speaker Teng Chang Kim quickly interjected asking Dr Hassan to calm down. “Jangan marah sangat, nanti darah tinggi (Don’t be so angry, or you’ll have high blood pressure),” said Teng, drawing laughter from the House. Bukit Lanjan Assemblyman Elizabeth Wong was also aggressive but with Templer Park’s Datuk Subahan Kamal who wanted to interject during her winding-up speech. Subahan was harshly refused by Wong, who is also the Tourism, Consumer Affairs and Environment exco, who sternly said: “Saya tak akan memberi laluan kepada budak-budak suruhan Menteri Pelancongan (I’m not giving way to the Tourism Minister’s lackeys).” Wong’s speech also prompted Sekinchan’s Ng Suee Lim to ask if there were plans to turn the Exco Village in Section 7, Shah Alam into a tourist attraction. “The State Government can generate revenue from entry fees into the Exco Village as I am sure many members of the public are eager to see what it is like in there. They can see for themselves an example of corruption,” said Ng, who was applauded by fellow Assemblymen. Whether in jest or otherwise, Wong replied she would bring the idea up with the menteri besar, adding there were similar suggestions for Istana Zakaria. 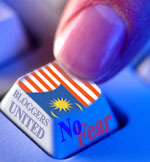 Posted by elizabethwong in 1, Current Affairs, Democracy, Malaysia, Note2Self, Politics. Tun Dr. Mahathir’s opting to get out from UMNO should not have surprised anyone. The question was not ‘why’ but ‘when’, as it followed the age-old tradition of former Prime Ministers and/or ex-UMNO presidents (with the exception of the late Tun Razak who passed away when in office). The gift of clarity descended only when they were not in power.